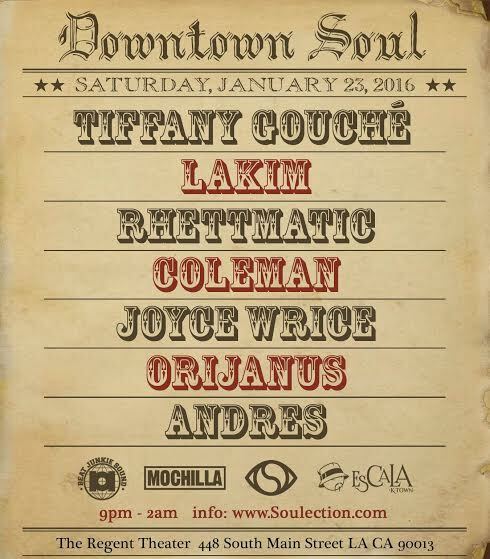 Tonight (January 23rd), a special one time event called “Downtown Soul” is happening at The Regent in Downtown Los Angeles. With an All-Star Line Up of talented Djs/Producers/Singers gracing the stage playing all types of good music: Tiffany Gouche, Lakim, Rhettmatic, Joyce Wrice, Coleman, Orijanus, & Andres. This is an event that you do not want to miss. For tickets & more info, go to www.soulection.com.